London has over 5000 restaurants which cover a vast range of establishments and cuisines, whilst having a choice is wonderful, it can make the selection of eating out a bit of a lottery. 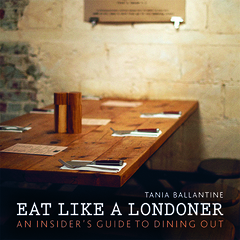 This book, Eat Like A Londoner by Tania Ballantine, an insider’s guide to dining out will make sure the odds are in your favour that you try to find a satisfying place to eat in London. The author has been a London restaurant critic for the last decade, reviewing for the capital’s best-regarded publications. She has worked at Time Out London and was a judge in the Time Out restaurant awards. She has also wrote articles for Square Meal, Food and Travel, Women’s Health and The Times. This extensive experience means that the book takes locals and visitors beyond the obvious destinations and highlights the places that have built great reputations for food and service. These establishments vary from the top end restaurants to local eateries, neighbourhoods and markets. This variety is broken down into themed chapters which include Cult Classics, Small & Buzzy, Perfect Pitstops, Late Night, Special Occasions, Something for the Weekend, Sensational Settings, Around the World and Sweet Stuff. Hundreds of restaurants open in London every year but few stand the test of time, the chapter entitled Cult Classic lists some of those who have managed to not only survive in a highly competitive market but go from strength to strength. High on many good food lists is Dabbous named after chef/patron Ollie Dabbous which offers haute cuisine with a bit of an edge. Equally popular is the Harwood Arms, the first London pub to receive a Michelin star. Hunan, Polpo and Roka are other notable restaurants that often feature on the must visit lists. The book reflects the modern features of dining, in an increasingly busy world, restaurants have to respond to the modern consumers who may expect establishments to cater for them at different times and for different moods. The sections on Small & Buzzy, Perfect Pitstops and Late Night highlight the trend away from formal dining. The chapter on Special Occasions considers another aspect of the London dining experience, finding restaurants to go in a group or with a date for that intimate meal. Brassiere Zedel, Flesh & Bun, Foxlow and Pizza Pilgrims provide plenty of options for a group, whilst Bob Bob Ricard, Fischer’s and Hakkasan will impress any potential partner. Most Londoners look forward to the weekend and often go out for breakfast or brunch or find a gastropub to enjoy a Sunday roast. The Something for the Weekend chapter offers plenty of options from E Pellici, a traditional East End cafe to the highly rated pub, the Bull & Last in Highgate. For all the wonderful ambience of a restaurant, some visitors may want to have a view to look at whilst they tuck into their meal. The chapter, Sensational Settings provides a number of restaurants that provide that something extra. The Boundary Rooftop, Min Jiang and Sushisamba offer a room with a view, meanwhile the Lido cafe and Shoryu offer a different kind of alfresco dining. The Around the World chapter pays tribute to the large variety of cuisines available in London, often certain areas are known for a particular countries cuisine, Chinatown being an obvious example. Middle Eastern, South Asian and Vietnamese are some of the most enduring cuisines in London and some of the best establishments are listed. However some Steak Houses, Tapas bars, Sushi and Dim Sum establishments get an honourable mention. For those with a sweet tooth, the final chapter offers some hints where to find the best cakes, chocolate, ice cream and pastries. Each chapter has a number of attractive photographs of the food and dining rooms, it also gives a run down of a number of restaurants which explain what is special about dining there, the location and address is added with phone number, website and nearest tube station. At the back of the book is a couple of maps with the various restaurants marked to give idea of their location in the various London neighbourhoods. This provides all the information you need to make an informed decision about whether the restaurant appeals to you. Eat Like A Londoner is a well written, informative and attractive book that offers more than 100 eating establishments for the reader to discover. The author offers something for everyone with advice on where to go for a fast meal or that special occasion. London restaurants have changed beyond recognition in the last 25 years, this book is an invaluable guide to enjoy some of the capital’s culinary delights. By londonvisitors2014 in London Book Review - Non Fiction on October 21, 2015 .